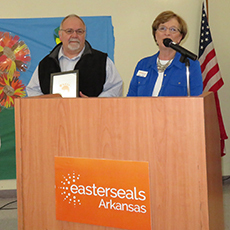 Johnathan Watson is a prime example of Easterseals Arkansas' continuum of services. 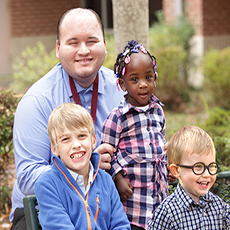 He started at Easterseals in 2003 when he was enrolled in our Little Rock Developmental Preschool. 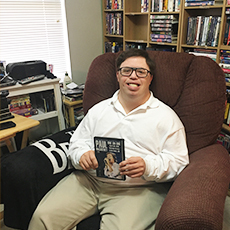 The summer before his senior year, he participated in our high school transition program – SET for Success – and completed his work experience in that program at our Children's Rehabilitation Center. 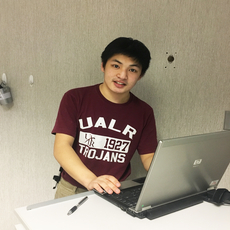 Now, he participates in our college program, ACCE, at UA Little Rock, and lives independently at one of our apartment complexes. 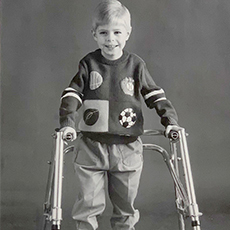 For over 70 years, Easterseals Arkansas has put hope within reach for thousands of adults and their families in Arkansas. We provide a variety of home and community-based services, affording opportunities for adults to live, learn, work and play in their community. We also provide resources, support, and education for family members and caregivers. 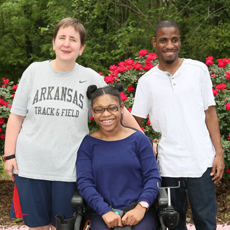 This lively crew will represent Easterseals Arkansas at various events throughout the year. Adult Rep Miracle enjoys her time at our Adult Center for Training & Wellness, while Youth Rep Jessica is one of our bright Academy at Riverdale students. GPCDC (Grand Prairie Child Development Center) Rep Jackson, represents our child developmental center in Stuttgart; and Child Rep Emanuel "Manny" Esquivel is one of our Little Rock Developmental Preschool's stars! The beauty of Art & Soul is that is showcases the different ways we can express ourselves regardless of our ability level. That idea is what makes this annual event so special, according to event chair Erin Dees. “I love that it brings out a talent in practically everyone no matter their disability or skill level. 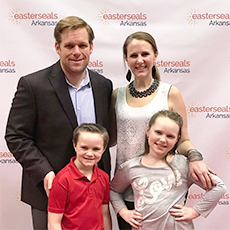 Art is something that everyone can benefit from and this event benefits all of Easterseals Arkansas,” she says. Our Academy at Riverdale has a new director in the lead. 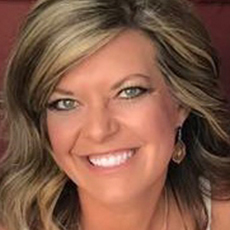 Karye Brockert comes to the private school for children with developmental disabilities with years of educational experience. The mother of a child with a developmental disability, she provides further insight to fellow educators and parents. 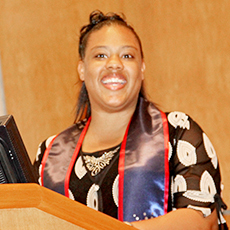 Another group of ACCE graduates is more prepared to compete in the workforce following successful completion of our college program in partnership with the University of Arkansas at Little Rock. In addition to on-the-job training and class instruction, ACCE (Academic, Community, Career Development and Employment Program) participants also enjoy being active in the college experience by attending Trojan games and engaging in homecoming festivities. 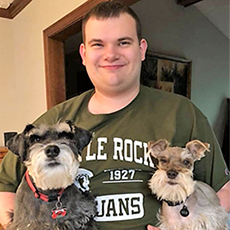 Jon Michael, 19, is one of our glowing students enrolled in our college program at UA Little Rock for students with intellectual and developmental disabilities. The Academics, Community, Career Development and Employment Program (ACCE) is an opportunity for students to have a college experience and prepare for competitive employment. Wilson Court, one of our apartment communities, has helped Matthew gain an independent lifestyle. Helping him maintain this independent lifestyle are employees through our in-home Medicaid Waiver services. 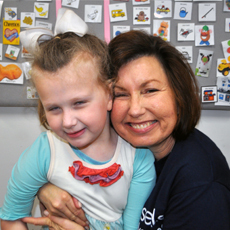 Windstream and Easterseals Arkansas have a very long relationship of both corporate sponsorship and volunteer efforts by individuals. 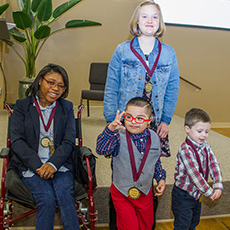 At the 2017 Annual Meeting, Jeff Heacox, who works in Windstream's Regulatory Compliance Department, was honored for his craftsmanship at Children's Rehabilitation Center. 2017 has been a year of many firsts for Londyn! 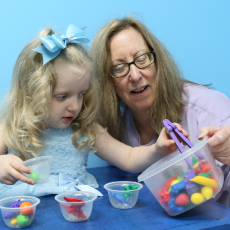 She’s been working hard with her Easterseals speech therapist, and it’s paying off. Her mother Sarah recently heard her say “bye-bye’ clearly for the first time. 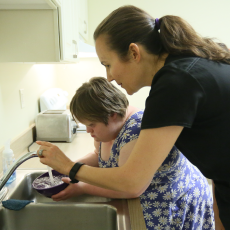 Easterseals adds several new programs this year to increase our services for teens and adults with special needs. ACCE at UA Little Rock, Academy at Riverdale for K–12 students, daily lunches and Be Well and Thrive at our Center for Training & Wellness and a new transition program for high school students coming this summer. Angela is one of Easterseals newest volunteers. 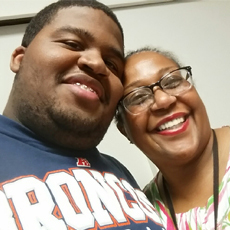 “I want to give back because Easterseals has done so much to help Jaelyn, my son,“ said Angela. Jaelyn is learning important computer skills at our Center for Training & Wellness.